It's not too often that I walk upset out of a restaurant in Singapore. But it definitely happens more often on my attempts to visit Italian restaurants. Perhaps because, being Italian, I know what the real thing should taste like, and it particularly irritates me when I get charged fine dining prices for food that can barely be categorized as home cooked food. Unfortunately, Bonta is one of those places. Having read advertisements raving about the multi-awarded head chef, I naively hoped their food would match the expectations set by the advertising campaign. Well... it doesn't, and it's not even close. I started getting suspicious as I went through their vast menu. I could count about 11 starters, 11 pastas/risottos, 10 mains and 6 desserts. It would be rather challenging for a fine dining restaurant to successfully maintain an appropriate level of quality with so many dishes on their menu. We were first served what was announced by the waiter as their 'renowned bread'. 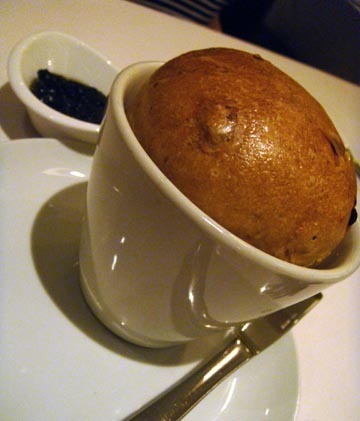 It was a warm load of bread served in a cup, enclosing a rich combination of Feta cheese, nuts and other ingredients. Not bad, but not particularly Italian either. Overall, I would say that this 'freebie' was their most successful dish. As a starter we ordered 'oven baked Australian scallops' ($24). They came with their shell, topped with spinach and a 'black olive hollandaise sauce'. On top of it all, an extra bit of greenery. I am not entirely sure what's Italian about this dish, but I would be happy to forgive the 'fine dining' creativeness if it was well done. 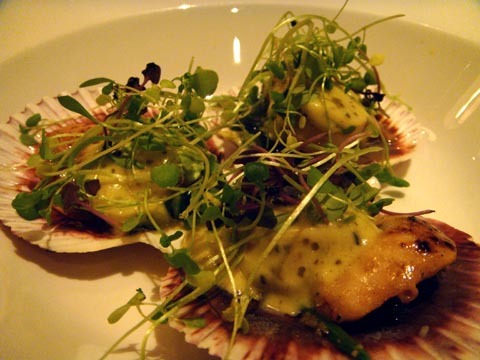 Unfortunately, the combination of oven baked scallops with hollandaise sauce, spinach and watercress doesn't quite work. Scallops are a subtle delicacy. Keep it simple. Now the pastas, what every respectable Italian chef gets a chance to prove himself with. 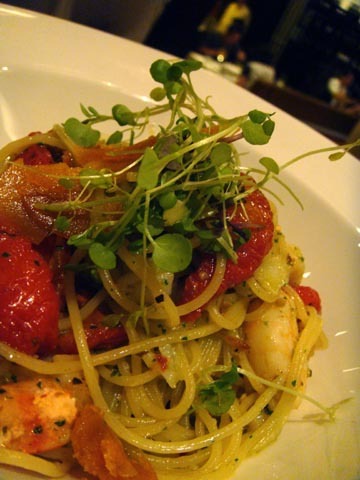 The 'spaghettini with tiger prawns, cod, sun dried tomatoes and bottarga' ($30) were topped by our favourite topping: watercress. Traces of bottarga could be spotted if you looked hard enough. Overall there was nothing particularly wrong with this pasta, but it wasn't exciting either. Just an average, rather oily pasta, which you would have in a normal 'pizzeria' (please note, not restaurant) if you were in Italy. 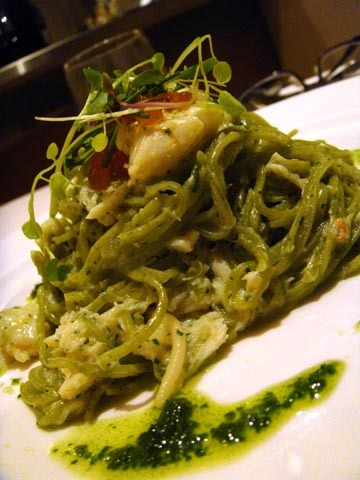 The same can be said about the 'homemade basil infuse angel hair with crab meat, chives and salmon roe in white wine sauce' ($29). Once again, topped by the usual magic touch of watercress and surrounded by oil and chopped basil. Flavours weren't quite as distinct and sharp as they should, and the whole thing had a rather creamy texture. We didn't order the desserts, as we thought we could save ourselves further disappointment and unnecessary bleeding of cash. The bill came up to $170 including 2 cocktails and a bottle of water. I am happy to spend such money for food that's worth it. Unfortunately Bonta is not the kind of place that makes me proud of being Italian. Take a look at their website: http://www.bonta.com.sg/. They sell Bonta as a fine dining restaurant. This is simply unacceptable, when obvious shortcuts are taken when it comes to produce, preparation and presentation. The service was friendly and efficient, while ambiance rather spooky and uncomfortable, probably due to the unsettling lighting. 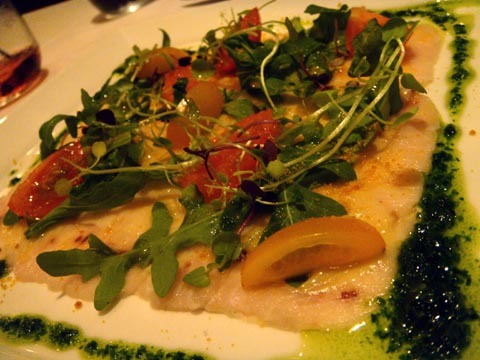 Next time, should I be around the area and crave for Italian, I will go to Cugini. Only a few steps away, I can have the best Italian food I have had in Singapore to date, and for a more reasonable price. Definitely a rip-off in our books too. Are you sure this Bonta is a fine dining restaurant, I personally disagree with u. As I came across their food is plated in so called semi fine dining style, still need more rooms for improvements. Few years back I totally agree with you they did have the standards of serving food to us. Now all the service staffs aren't really well knowledgeable on the menu they are selling. Food arrived with horrible plating compared to those fine dining restaurants. I Believed that those media who film pictures for Bonta have some special privileges that's why say so much good points on everything.